The way to Bath that doesn't involve the railway cycle path. If you didn't know this before, there's lots of hills between Bristol and Bath - this road samples many of them. If you've got more time, I recommend getting to Whitchurch in a more scenic way. However if you haven't experienced leaving Bristol through Bedminster - it's an interesting face to the city and the A37 throws you out in the right direction. From Whitchurch onwards there's a succession of twisty quiet lanes that look and feel completely different to the Bristol status quo. With three pronounced hills getting you into Bath, it's not the easiest route to get you into the historic city of Bath - however for taking the road less travelled it will make all the difference. As some of the lanes are particularly 'rural' there's some stretches with dusty/muddy roads - so it's best to avoid this route on a rainy day. 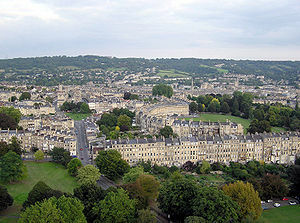 Once you've arrived in Bath you'll experience one of the toughest climbs in the Bristol area - Landsdown Lane before looping around and returning on the admittedly drab A431. It is possible to re-route back onto the Bristol-Bath cycle path to avoid the A431.